Just as their name implies, these metric hoist rings are made for side-loading. They are easy to rig too, because they are made to work with standard screw pin anchor shackles, such as the Crosby G-209 Screw Pin Shackles. Lift up to 90º angles and still achieve the full 100% Working Load Limit of the ring. They are individually proof-tested to 2-1/2 times the Working Load Limit. 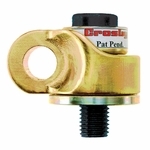 Made from forged steel with a Yellow Chromate finish, and each hoist ring is RFID equipped.